On April 12, the far-right Jobbik candidate won a by-election in the individual constituency of Tapolca. The election took place due to the death of former Fidesz MP Jenő Lasztovicza in early January 2015. The electorate dissatisfied with the performance of the government turns to the political side it considers capable of defeating Fidesz. On February 22, in the Veszprém by-election this meant giving the mandate to the individual candidate supported by left-wing parties, Zoltán Kész, and in Tapolca backing Jobbik candidate, Lajos Rig. With this the governing party’s “central power field” strategy that worked well in 2014 has suffered a setback, just as the myth that Fidesz can stop the rise of the far right. 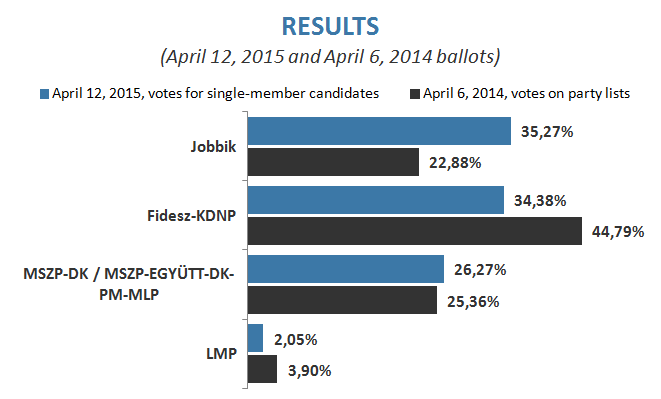 Jobbik can consolidate its position as the challenger of Fidesz, and could even go first in the polls.